Three species of Trichoderma viz., T. harzianum, T. konengii and T. viride have been isolated from the soil samples collected from forest sites in higher altitudes of Indian Himalayan Region. The species could grow between 9 to 35°C temperature and 4 to 12 pH on agar plates; the optimum requirement being 24°C and 5.5 pH, respectively. Further incubation of the agar plates showing normal growth of Trichoderma sp. at 4°C, induced heavy sporulation in three weeks of time. Induction of sporulation on exposure to low temperature appeared to be a strategy for survival of these species in extreme cold environment experiencing sub zero temperatures. Antifungal activities were demonstrated between Trichoderma sp. and phytopathogenic fungi in dual cultures. The antifungal metabolites produced by Trichoderma sp., diffusible as well as volatile, caused abnormalities in fungal structures of pathogenic fungi. Plant growth promotion abilities of Trichoderma sp. was also demonstrated through a plant based bioassay in greenhouse. The study is important for documentation of microbial diversity of Indian Himalayan Region (IHR) and determination of the associated biotechnological applications. Trichoderma species are free living fungi that occur in nearly all the soils and other natural habitats. They can be easily isolated from soil and decomposing organic matter. Most of the Trichoderma sp. grow rapidly in artificial culture media and produce large numbers of green or white conidia from conidiogenous cells. Their abundance in soil under diversified climatic conditions is mainly due to their ability to degrade a variety of organic substrates in soil, their metabolic versatility and their resistance to microbial inhibitors. Certain strains of Trichoderma sp. including T. viride are known to be restricted to the areas identified by low temperature, T. harzianum is mostly found in warmer climate and strains of T. hamatum and T. konengii are widely distributed in areas of diverse climatic conditions. Diversity in various ecosystems, including forest and mountains and molecular taxonomy of Trichoderma sp. have received importance in the recent literature (Grondona et al., 1997; Kullnig-Gradinger et al., 2002; Fu-Qiang et al., 2004; Woo et al., 2006). Several species of the genus Trichoderma received attention mainly due to their importance in biological control of soilborne plant pathogens. Antibiosis, mycoparasitism and competition for nutrients are the mechanisms involved in biological control. Recent studies have shown that they are opportunistic, avirulent plant symbionts, as well as the parasites of other fungi. Many species of the genus Trichoderma have also been recognized for their plant growth promotion abilities (Vizcaíno et al., 2005). In the present study, three species of Trichoderma isolated from soil samples collected from forest sites in high altitudes of IHR have been investigated in vitro for growth characters and biocontrol properties. Bioassay was also performed to demonstrate the effect of these species on plant growth. Soil samples were collected from various locations in high altitudes (beyond 3000 m above mean sea level) of Pindari Glacier region of Uttarakhand in IHR (Pandey et al., 2008). Serial dilutions of soil samples were made for isolation of fungi. Appropriate dilutions were plated (pour plate method) using Czapek, Potato Dextrose (PD), Sabouraud Maltose and Malt Extract agar. The agar plates were incubated at 21°C for 7 days. Morphologically distinct colonies were subjected to purification following subculturing. The pure cultures were maintained on PDA slants at 4°C in a refrigerator. Based on colony morphology and microscopic observations (smears made in lactophenol cotton blue) the frequently occurring species of genus Trichoderma were selected for further experiments. The species level identification was carried out with support of Indian Type Culture Collection, Indian Agricultural Research Institute, New Delhi and Agharkar Research Institute, Pune, India. For colony morphology and microscopic observations, fresh cultures were grown on PD agar at 21°C for 5 days. After taking observations on growth characters, the plates were kept in refrigerator. The temperature and pH requirements of the Trichoderma sp. were determined by incubating the fungal isolates at different temperatures (4, 9, 14, 21, 28, 35 and 42°C) for 7 days and by inoculating the fungal isolates on PD agar plates set at different pH levels, i.e., 3.0-13.0 with an interval of 0.5 unit. For salt tolerance, the cultures were inoculated on PD agar plates supplemented with 2.0, 5.0 and 7.0% salt, respectively. where, R1 control value represents the largest distance grown by the test fungus in the direction of maximum radius, R2 represents the distance between the inoculum of pathogen and Trichoderma sp. where, r1 was the radial growth of pathogen without Trichoderma sp., r2 represents the radial growth of pathogen inoculated with Trichoderma sp. All the experiments were conducted in triplicates. Fungal smears were prepared in lactophenol cotton blue taking the growth from the inhibition area. Fungal smears were also prepared from the control plates to make the comparison. Bioassay for Evaluation of Plant Growth Promotion Ability of Trichoderma sp. Wheat (Triticum aestivum L.) was chosen as a test species for conducting the bioassay under greenhouse conditions. The four treatments under consideration were: 1-Control (seeds without any inoculum) and 2, 3 and 4-seeds inoculated with T. harzianum, T. koningii and T. viride, respectively. Trichoderma inoculum (for each species, individually) was grown on PD agar plates (incubated at 21°C for one week). Three mycelial discs (5 mm) of Trichoderma sp. were cut from the agar plates and used as inoculum for one seed at the time of sowing. Seeds were grown in trays (32x32x10 cm) containing 16 cups. The trays were kept inside the greenhouse (24.0±2°C) of the Institute. Each treatment was taken in triplicate (48 seeds for each treatment). After 42 days of growth, 10 plants from each treatment were selected randomly and fresh weight of roots and shoots were taken. Dry weight was taken after drying the roots and shoots in oven at 65°C for 48 h. Data was statistically analyzed using ANOVA. Analysis of rhizosphere soil was done for determining the effect of inoculation on rhizosphere microflora. Soil samples (in triplicate) were collected from all the four treatments and serial dilution technique was carried out for bacteria and fungi on tryptone yeast extract and PD agar, respectively. Enumerations were made after 5 days of incubation at 21°C. The frequently occurring fungal species in soil samples of glacier sites in high altitudes of Indian Himalaya mainly belonged to the genera Alternaria, Aspergillus, Chrysosporium, Cladosporium, Epicoccum, Fusarium, Gangronella, Myrothecium, Paecilomyces, Phoma, Phytophthora and Trichoderma (Pandey et al., 2008). Trichoderma was observed as one of the most frequently occurring genus in dilution agar plates throughout these experiments. The species were often observed covering the entire area of the culture plates, not allowing the other species to grow. The colony morphology and microscopic features of three species of Trichoderma are presented in Table 1. Based on these characters, the Trichoderma sp. were identified as T. harzianum, T. konengii and T. viride. These species could grow between 9 to 35°C temperature and 4 to 12 pH on agar plates. All the three species of Trichoderma could tolerate salt concentration upto 5% (w/v). The optimum temperature and pH requirement of these species was observed to be 24 and 5.5°C, respectively. It was interesting to note that all the three species showing mycelial growth with moderate sporulation after 5 days of incubation at 24°C resulted in heavy sporulation in about three weeks when shifted to 4°C. Induction of heavy sporulation due to low temperature might be a strategy of these species for their survival under low temperature environments including the sub zero temperatures. Table 1: Growth characters of Trichoderma spp. Table 2: Biocontrol related properties of Trichoderma sp. 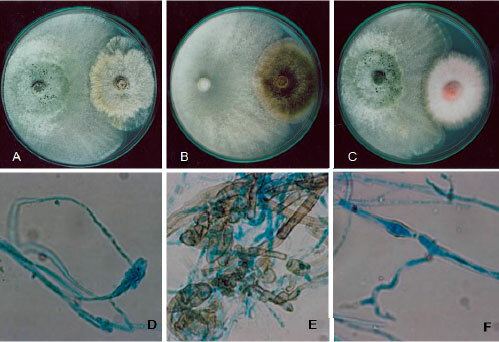 In plate based experiments, all the three species of Trichoderma showed antagonistic interactions against the five test phytopathogens, Alternaria alternata, Cladosporium oxysporum, Fusarium oxysporum, Pythium afertile and a non-sporulating dematiaceous fungus (Fig 1A-C). Table 2 presents the results on the effect of diffusible and volatile metabolites produced by Trichoderma sp. in terms of reduced radial growth of the test fungus. The inhibition of test pathogens due to production of diffusible metabolites ranged from 53.33 to 66.66%, 47.82 to 63.33% and 57.77 to 73.90% by T. harzianum, T. konengii and T. viride, respectively. While inhibition due to production of volatile metabolites ranged from 39.63 to 55.55%, 38.26 to 64.16% and 39.63 to 74.99%, by T. harzianum, T. konengii and T. viride, respectively. None of the species of Trichoderma showed visible inhibition of pathogenic fungi Pythium afertile, probably due to the relatively fast growing nature of pathogen. Microscopic observations revealed that diffusible as well as volatile substances induced morphological abnormalities in fungal structures. Deformation in mycelial, hyphal, or conidial structure was common in all the test fungi (Fig 1D-F). In general, the diffusible substances appeared to be more effective as compared to volatiles. Induction of deformities was probably due to the ability of Trichoderma sp. to develop direct interaction with pathogens and to produce antimicrobial substances as the mycoparasitism involves physical contact and synthesis of hydrolytic enzymes, toxic compounds, or antibiotics (Benitez et al., 2004). Studies have been conducted on effect of low temperature on spore germination and germ tube growth of Trichoderma strains. In earlier studies, performed on cold tolerant species of Trichoderma, out of 360 Trichoderma strains investigated, 14 (identified as strains of T. aureoviride, T. harzianum and T. viride) could grow well at 5°C; all the cold tolerant strains produced appresoria and antagonized the plant pathogens, Rhizoctonia solani and Fusarium oxysporum f. sp. Dianthi, in dual culture tests performed at 10°C (Antal et al., 2000). Knowledge of the prevalence of environmental conditions, both climatic and edaphic, in the habitat of a given organism may be useful for exploitation of the potential applications associated with the organism. The habitat of the species of Trichoderma in present study was forest locations mainly dominated by species of Abies, Rhododendron and Betula. Dominance of Trichoderma species in tea gardens and temperate forest locations of Indian Himalayan Region has been reported (Pandey et al., 2001). Species of Trichoderma are known for their competence for rapid colonization of plant roots. Due to their nature of colonizing in presence of healthy roots they have evolved numerous mechanisms for attacking other fungi and for enhancing plant and root growth (Harman et al., 2006). Observations taken on wheat based bioassay were indicative of plant growth promotion abilities of the Trichoderma sp. Biomass of root and shoot of wheat in inoculated plants was higher after 42 days of growth as compared to control, statistically significant (p<0.05) in most cases. Maximum benefit was observed in case of T. koningii. The inoculated Trichoderma sp. colonized the rhizosphere of test plant species and increased the plant biomass. Further, Trichoderma sp. inoculation stimulated the bacterial and suppressed the fungal population in the rhizosphere of test plant, i.e., wheat, indicative of associated antifungal properties. In an earlier study, T. viride (same strain that is used in the present study) was found to provide protection to the young seedlings of Cedrus deodara against mortality due to cutworms attack and wilting caused by Fusarium sp. Improvement in plant health mainly due to improved nutrient uptake was also recorded in the cited study (Bisht et al., 2003). Trichoderma sp. have got attention due to their role in biological control. Mycoparasitism has been proposed as the major mechanism supporting the antagonistic activity of Trichoderma sp. Strains of Trichoderma sp. inhibit pathogens through production of antifungal antibiotics and or/hydrolytic enzymes. Ability for plant growth promotion and induced resistance in plants by Trichoderma sp. has also been reported (Monte, 2001; Vizcaíno et al., 2005; Harman, 2006). The present study is important in view of the documentation of soil microbial diversity in Indian Himalayan Region. It is mainly based on the isolation of three most frequently occurring species of Trichoderma and demonstration of their biocntrol abilities. Isolation and screening of cold tolerant strains of Trichoderma sp. is important in order to select biocontrol agents for application in colder regions. The species of Trichoderma used in the present study have been deposited in Indian Type Culture Collection (ITCC), Indian Agricultural Research Institute, New Delhi and Agharkar Research Institute Fungus Culture Collection (ARIFCC), Agharkar Research Institute, Pune, India; the accession numbers are presented in Table 1. The species should be used for further studies on production of hydrolytic enzymes related to biocontrol as well as the strategies adopted for their survival under cooler regimes. Director, GBPIHED is thanked for extending the facilities. Department of Biotechnology is thanked for partial financial support. Two anonymous reviewers are gratefully acknowledged for providing suggestions on the manuscript. Antal, Z., L., Manczinger, G. SzakaÂcs, R.P. Tengerdy and L. Ferenczy, 2000. Colony growth, in vitro antagonism and secretion of extracellular enzymes in cold-tolerant strains of Trichoderma species. Mycol. Res., 104: 545-549. Benitez, T., A. Rincon, C. Limon and A. Codon, 2004. Biocontrol mechanism of Trichoderma strains. Int. Microbiol., 7: 249-260. Bisht, D., A. Pandey and L.M.S. Palni, 2003. Influence of microbial inoculations on Cedrus deodara in relation to survival, growth promotion and nutrient uptake of seedlings and general soil microflora. J. Sustain. For., 17: 37-54. Fu-qiang, S., T. Xing-Jun, Li. Zhong-Qi, Y. Chang-Lin, C. Bin, H. Jie-jie and Z. Jing, 2004. Diversity of filamentous fungi in organic layers of two forests in Zijin mountain. J. For. Res., 15: 273-279. Grondona, I., R. Hermosa, M. Tejada, M.D. Gomis and P. Mateos et al., 1997. Physiological and biochemical characterization of Trichoderma harzianum. A biological control agent against soilborne fungal plant pathogens. Applied Environ. Microbiol., 63: 3189-3198. Harman, G.E., 2006. Overview of mechanisms and uses of Trichoderma spp. Phytopathology, 96: 190-194. 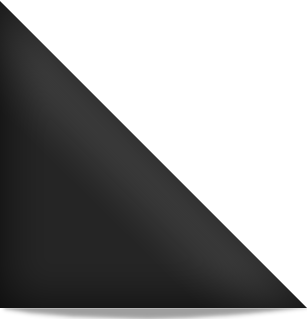 Kullnig-Gradinger, C.M., G. Szakacs and C.P. Kubicek, 2002. Phylogeny and evolution of the fungal genus Trichoderma-a multigene approach. Mycol. Res., 106: 757-767. Monte, E., 2001. Understanding Trichoderma: Between biotechnology and microbial ecology. Int. Microbiol., 4: 1-4. Pandey, A., L.M.S. Palni and D. Bisht, 2001. Dominant fungi in the rhizosphere of established tea bushes and their interaction with the dominant bacteria under in situ conditions. Microbiol. Res., 156: 377-382. Pandey, A., N. Das, B. Kumar, K. Rinu and P. Trivedi, 2008. Phosphate solubilization by Penicillium spp. Isolated from soil samples of Indian Himalayan region. World J. Microbiol. Biotechnol., 24: 97-102. Vizcaino, J.A., L. Sanz, A. Basilio, F. Vicente, S. Gutierrez, M.R. Hermosa and E. Monte, 2005. Screening of antimicrobial activities in Trichoderma isolates representing three Trichoderma sections. Mycol. Res., 109: 1397-1406. Woo, S.L., F. Scala, M. Ruocco and M. Lorito, 2006. The molecular biology of the interactions between Trichoderma spp., phytopathogenic fungi and plants. Phytopathology, 96: 181-185.